Four women in Haven, Michigan find that life in a small town, whether they've just returned or have never left, can be just as tumultuous and disappointing, as it's ever been. Are they living the life they've imagined? Maeve is the proprietor of the local convenience store and the mother of her daughter, Anna, a Chicago city lawyer. Maeve never thought that the convenience store was going to be her career, but she's been waiting twenty years for her husband to return after he left her and Anna one day with no word. Recently, she's been receiving letters from him, promising her a better future. Anna has lost a close friend and mentor at the Chicago law firm and has been granted bereavement leave. Returning to Haven isn't easy, but she's not sure where else to go. She's always been strong, almost cold, but coming back to Haven means she might have to deal with her ex-boyfriend, the man who might be the love of her life, who she broke up with before they left for different colleges. Amy, once overweight in high school, has now become obsessed with maintaining her successful weight loss. She's engaged to the son of the town's richest developer who happens to be planning to renovate Haven to appeal to tourists and Maeve's convenience store is one that will soon be destroyed. Amy's dream to have her perfect wedding, though, is on track. So she thinks, until the stress of wedding planning and wondering if she's making the right decisions has her doubting. Recently, she's bumped into Ed, an overweight and friendly guy who has a dog that just happens to get along with her own dog. Will the life she's imagined be what she's needing? Ultimately, I liked this story a lot, even though each character frustrated me with Amy disappointing me completely. I cheered her on and for just a moment, I thought she had grown a backbone, but then...she didn't. 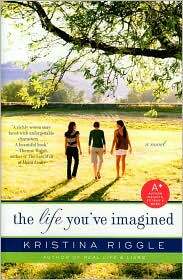 With each chapter alternating between the primary characters making it a quick read, and although I wanted just a touch more from specific secondary characters, Kristina Riggle successfully exposes the lives of four women who feel like they just may have missed out on life. After a while, each character finds that there is a beauty and sadness in realizing that it may be possible that the life being lived right now isn't any better or worse than what imagination can bring. Moral of the story? Make good choices, people. But, no matter what, never look back. "You look lovely," I tell her. This struck a chord with me. I know that if I don't feel good about myself, no amount of compliments will make me happy. I hate how we as women do this to ourselves. Thanks to the Crazy Book Tours team for sending me a copy of this book for review! I liked this book a lot and really want to read more of Riggle's work. I was so excited about this book and then never got to it. Sounds like it has a good message though! Oh wow, I am so glad to see you liked this one since you just sent it to me so now I get to read it! I am intrigued but not completely sold yet. bermudaonion - Ultimately, I did like this one, and I do want to read her other book as well. I've heard a lot of good things about it! Jenny - It definitely has a good message; make good choices, don't spend time on regret, and enjoy life. Let me know if you read it! Amused - I did like it a lot, I only had a few issues with certain sections, or character habits. It was a great book to escape with! Not even heard of this book, but I do like the "moral" as you put it - never looking back's the key! I have to read this one. Sounds like my cup of tea. I love chick/women's lit or whatever its called nowadays. I'll be adding this title to my TBR list. And I loved the quote you included - you are so right that we women tend to beat up on ourselves more than anyone (its such a bad habit!). The fact that this book focuses on so many women, and intertwines their stories makes me want to read this, but I am also very curious and intrigued by your perception of Amy, and want to find out what goes on with her. I also loved that quote and know it to be true in my own life. Riggle sounds like a very perceptive woman. This book sounds really good, even if it isn't the kind of book I'd normally pick up. I like the sound of the story and moral, though, and you seemed to have really enjoyed it... I think maybe I'll look into it. I had wanted to read this when I first started heating about it but then promptly forgot all about it. I'm so glad you reminded me. It's going on my wish list right now. I will have to read this - I love that it is set in Michigan! I don't read a ton of women's fiction but this one sounds appealing. I think everyone can relate to the idea of feeling like perhaps life has passed you by. This sounds like a great book. It is so true what you said about feeling good about yourself. It is so important. Wow. Awesome review and I like the moral. I also love what you said in the end. So many of us do that. We hear the bad and barely notice the compliments. This one really appeals to me for some reason, even though women's fiction is not normally high on my list of things to read. I have a copy somehow (and somewhere). I'll have to make time to read it. Sounds like an interesting read -- I love books about strong women. Great review! Sounds like one worth giving a go. I've read a few good reviews on this one. I have not heard of this one before but it sounds like such a great book club read! I love your review and how you broke the characters down for us! Fantastic!! !